Welcome to the 360th Metamorphosis Monday! Linda has transformed it again for the holidays and it’s a winter wonderland with lots of great accent pieces pulled right from nature. Do you recognize the lamp? Yep, that’s the same one you saw in this post on Friday: Adding a Touch of Tartan to the Kitchen When I saw Linda’s fabulous porch and that great lamp, I couldn’t wait to add a bit of tartan to my own home. 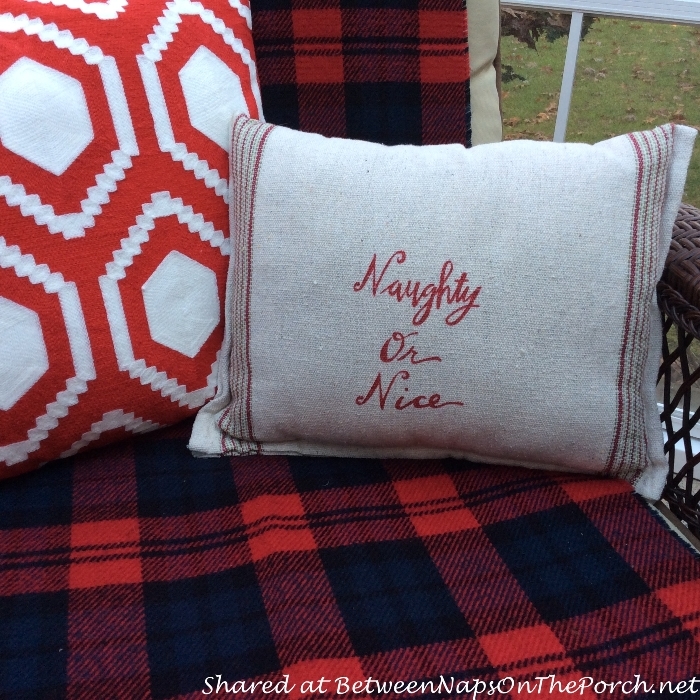 Don’t you absolutely love Linda’s whimsical pillows! The antler horns pillow cracks me up! So fun! Notice the cute little truck bringing home the Christmas tree. 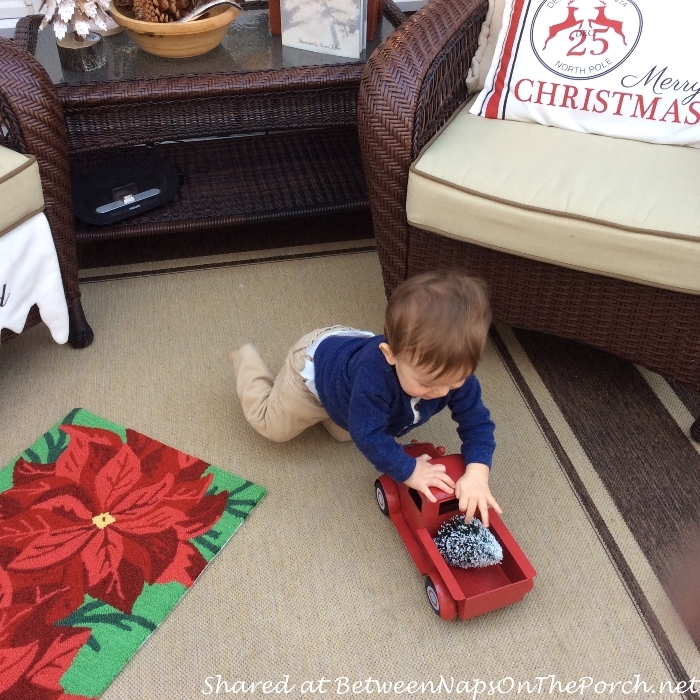 Linda’s grandson knew exactly how to work that decoration! Sooo cute! I see another fun pillow, too. 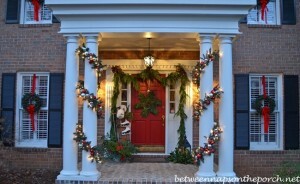 I love the oversized decorations Linda used on her porch tree. 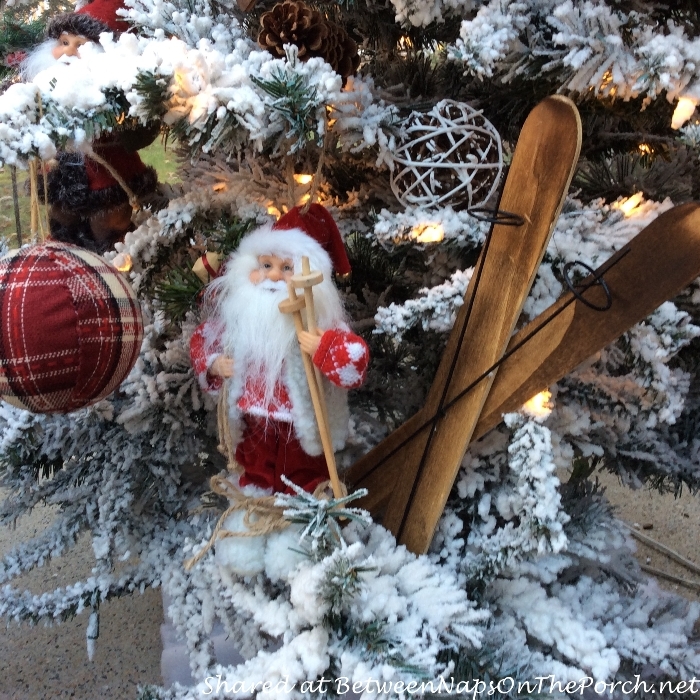 The tree is decorated with a variety of Santas, skis and plenty of tartan accents. 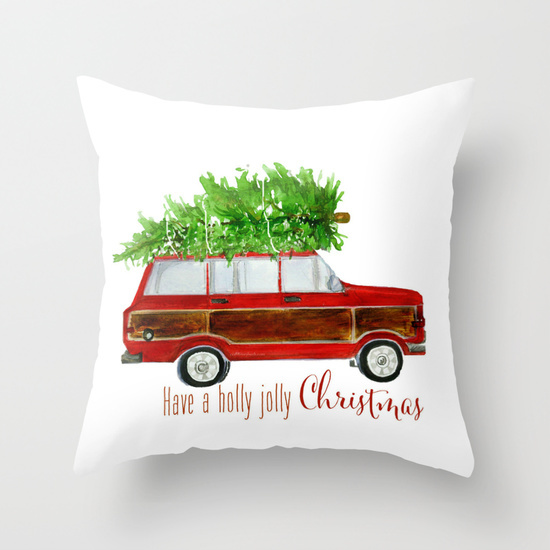 This one is also one of my favorites by Lucy: Christmas Wagoneer Love her work! Tucked into a corner Linda has another small nature-themed covered in lots of adorable owls. 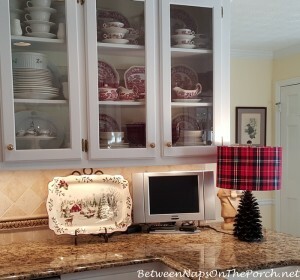 Linda has two of the tartan lamps and I really like how she raised this one by sitting it atop a little stool. If you have an area that could use a taller lamp and you don’t have one, this is a great way to give a lamp some additional presence and height. Lamps also look great perched atop a stack of books or a pretty wood chest/box. Ohhhh, one of my favorite poems by Robert Frost! This makes me want to get my copy out to display for the winter. Such a great poem with wonderful imagery! Thanks so much to Linda for sharing her beautiful porch. I’ll ask Linda to share another picture of her beautiful tree and I’ll add it to this post. We need to see more of that gorgeous tree! Hi Susan, thanks for sharing Linda’s porch, it is lovely! Mine is a barren wasteland now, but these photos have motivated me to get out there after Christmas and fluff it up:) As always, thank you for hosting Susan. I hope you have a wonderful Christmas! Hi Susan, thank you for sharing Linda’s porch, it is lovely! The photos have motivated me to get out to my barren wasteland of a porch and fluff it up after Christmas:) As always, thank you for hosting and I hope you have a wonderful Christmas! Oh my gosh what a gorgeous porch ! And those tartan lamps – holy cow – just beautiful ! Thanks so much for the party Susan – hoping you and yours have the most wonderful of Christmases this year ! lol Suzan, you are so cute! Merry Christmas to you and I hope it turns out to be a white one. We have rain here today so maybe that rain will find it’s way north and turn into snow for you! Merry Christmas Susan! 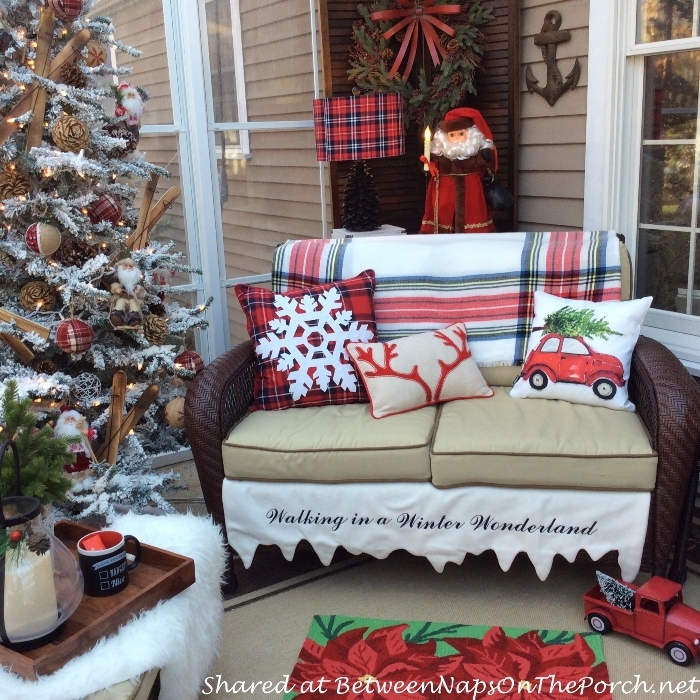 I love seeing Linda’s porch through the seasons, and this Christmas one is my favorite~ love the ski tree and the tree topped car pillows! Thanks for a year of great parties! 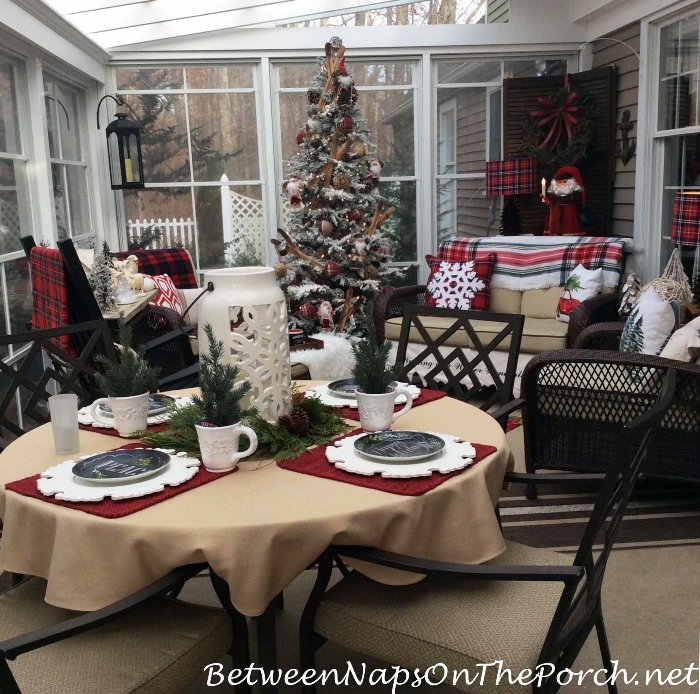 Linda’s porch looks beautiful in Christmas décor. I love that Walking in a Winter Wonderland snow piece and the way she used it on the sofa. So clever! 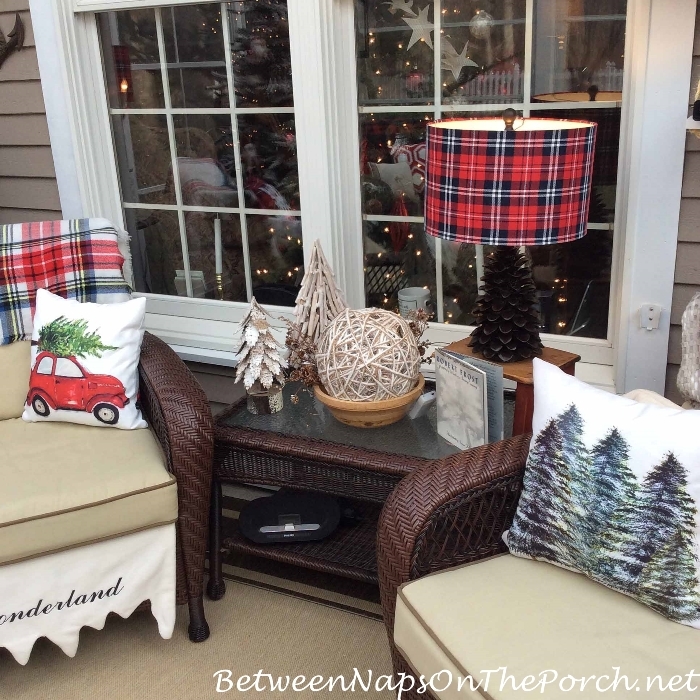 Of course, I also love anything plaid, so the whole theme of the porch appeals to me. And yes, she has some really cute pillows. Thank you for sharing this. Linda’s porch is great. You know what I love that caught my eye right away? The snow-melting skirt on the settee! Susan, thanks so much for another year of hosting us on Monday mornings. Have a great week! I know…I love that, too. Linda told me she sometimes uses it as a mantel scarf. 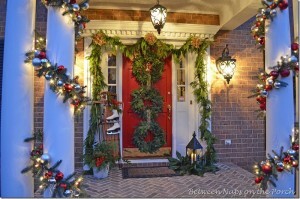 Love Linda’s porch all decorated for Christmas. Thanks so much for sharing and for hosting every week. Hope you have a very Merry Christmas! Linda’s porch is so very charming. Love it! Her Christmas Wagoneer bring back happy memories for me. When my husband and I were first married we had a Grand Wagoneer like the one on Linda’s pillow. We always put a Christmas wreath on the front grill and garlands draped around the roof rack. Merry Christmas Susan! I hope she will share MORE pictures of that gorgeous tree!! Everything is just beautiful!!! Does she have a blog? If so I would like to follow her! Thanks for sharing this, Susan and Merry Christmas to you and Linda too!!!! Susan, thanks so much for always being so gracious to open your site to others! It has been a pleasure to see all of the inspiration afforded on your site! Merry Christmas! Oh my goodness! I absolutely love EVERYTHING about that porch. Just one question. The “Walking In A Winter Wonderland” cloth hanging down on the love seat. Is that a fireplace mantle scarf? I need that!! I bought that Walking In a Winter Wonderland scarf several years ago in a little country shop near my home…it’s made of felt and the letters are embroidered . In the store, it was displayed laying on a wall mounted shelf and they also put one on top of a hutch. It can be used in many ways…this is the first year I tucked it under the settee cushions. 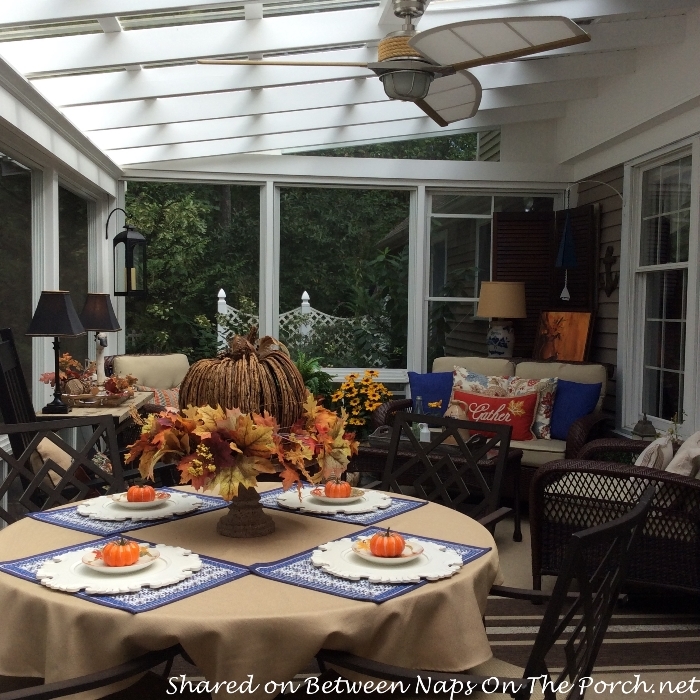 I love that Susan has featured my porch on her blog…I don’t have my own blog…but I am thinking about it! Thanks everyone for the wonderful comments…Merry Christmas! 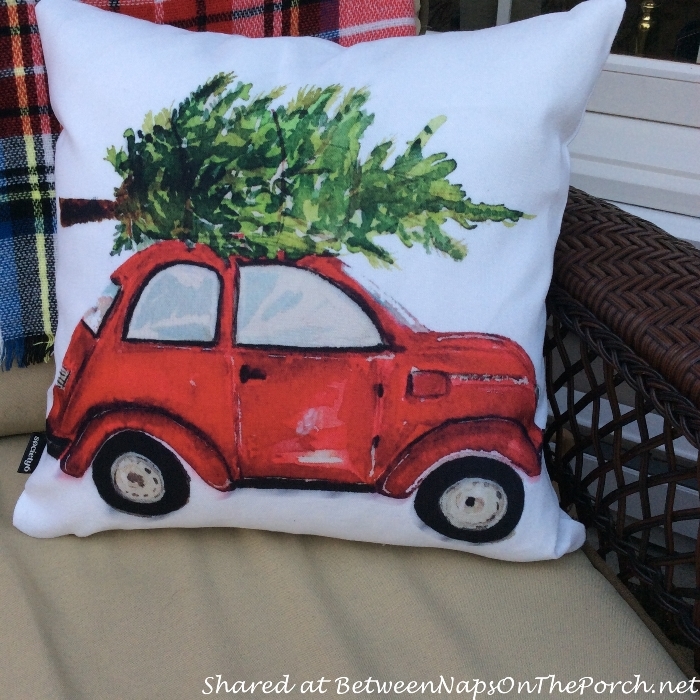 I love the pillow with the trees on it!! That one is my favorite!! 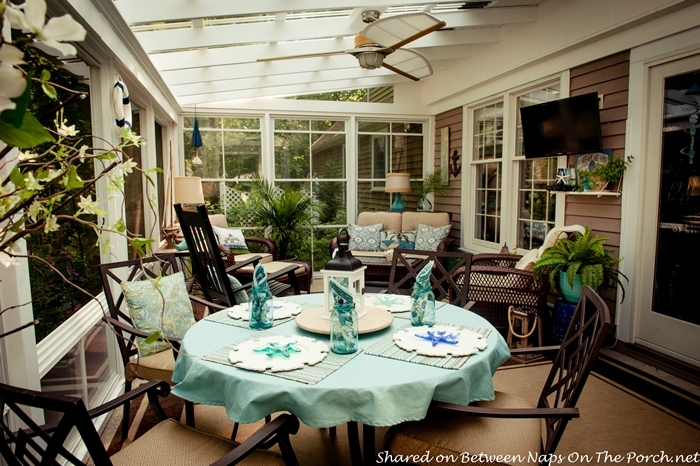 Oh my I’d love to decorate my sunroom just like that!! But we would end up freezing here in Ontario Canada. Love Love Love that lamp!! Susan, Your site is beyond wonderful. What a tremendous gift it has been for me since I found it. A visual feast! Thank you for all the time and love you put into it. I am so inspired. Thank you for hosting Susan! Merry Christmas! I would like to know where Linda got those snowflake chargers on her dining table. I LOOOVE them. The porch is beautiful. So much eye candy!!!! The chargers are from Pier 1…appear as a snowflake, however they are part of their everyday stock…they have 8 scrolled edges giving a snowflake effect! 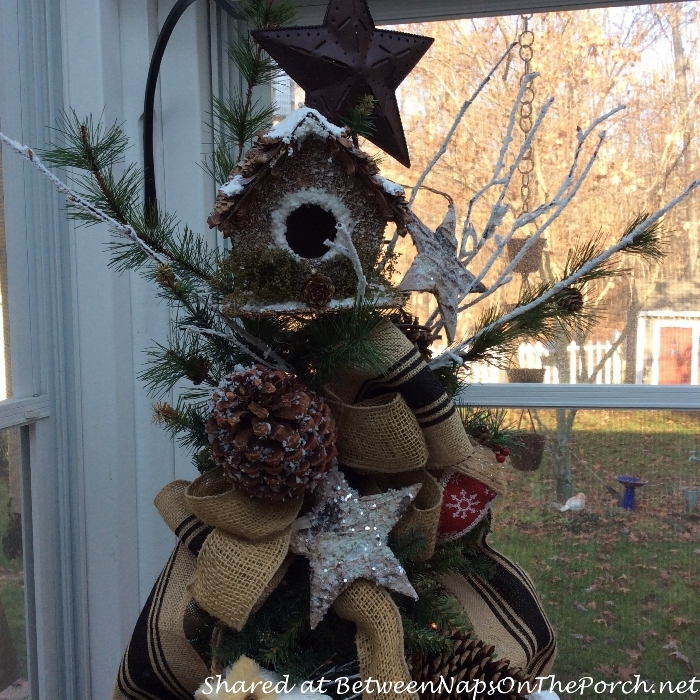 I love the idea of non-traditional ornaments. That makes the trees so unique to the owner instead of everyone having the same decorations that have been massed produced in the stores. Even though there is nothing wrong with that as I have a bazillion ornaments from the store. I had a book my mother gave me for christmas one year. 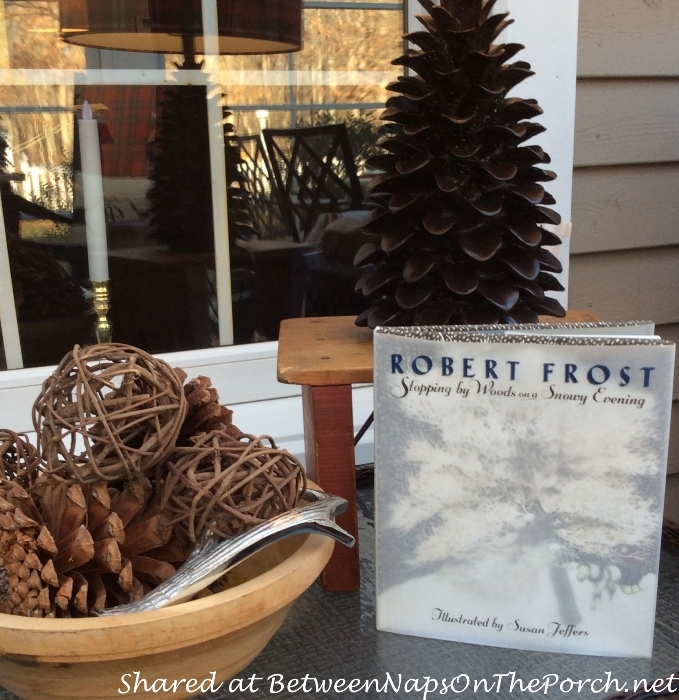 It was a coffee table book of pictures of winter scenes and poems. I read that book cover to cover every year. And now I couldn’t tell you where it is. She said it reminded her of me, because it was all rustic pictures and I always loved the country. Guess I need to find another one. Hello Susan, Linda’s porch is just beautiful. Do you think she would give us a tour of the inside of her home? She is a great decorator. It would give us some new ideas. I enjoy looking at others decorations. Thanks! Susan, Linda’s porch is just beautiful. Do you think she would give us a tour inside of her home? She is a wonderful decorator. It could give us some new ideas. Thanks! I’m not sure…I’m sure it’s lovely, though! Hi Christina and Merry Christmas! Thank you for the inquiry about the throw on the loveseat…believe it or not I found it last year at Ross Dress for Less store in the scarf section! It is one of those oversized scarves! It isn’t very heavy and is not very sturdy however it serves its purpose for now! Hope you can find one that suits your needs.